BARCELONA, Spain, Feb. 7, 2019 /PRNewswire/ Grifols, a leading global producer of plasma-derived medicines and a leader in the development of innovative diagnostic solutions, announced today that the U.S. Food and Drug Administration (FDA) approved the Procleix Babesia assay, a qualitative assay for the detection of the ribosomal RNA from 4 Babesia species (B. microti, B. duncani, B. divergens, B. venatorum) in individual samples or up to 16 pooled lysed specimens from human donors, including donors of whole blood and blood components for transfusion. 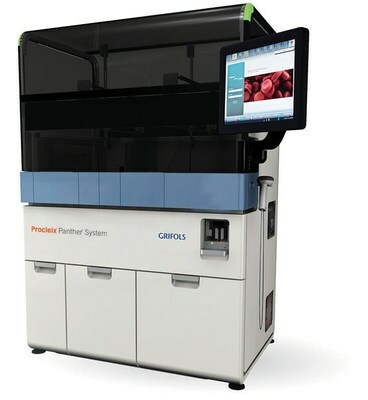 The assay runs on the Procleix Panther system a fully automated platform utilizing Nucleic Acid Testing (NAT) for blood screening. The FDA approval recognizes a successful multi-center clinical trial conducted under an Investigational New Drug (IND) study at the American Red Cross, Creative Testing Solutions, and Rhode Island Blood Center (an affiliate of the New York Blood Center, Inc.), in select areas of the U.S.
Babesiais a parasite that can be transmitted to humans by tick bites or through donated blood from Babesia-infected donors. According to the Centers for Disease Control and Prevention (CDC), the highest numbers of Babesia infections occurred in Massachusetts, New York, Connecticut, Rhode Island, New Jersey, Maine, New Hampshire, Wisconsin, and Minnesota. Grifols' three main divisions Bioscience, Diagnostic and Hospital develop, produce and market innovative products and services that are available in more than 100 countries.